Cosmic rays can loosely be defined as radiation consisting of energetic particles originating outside of the Earth. Cosmic rays are composed mainly of ionized nuclei, roughly 87% protons, 12% helium nuclei and most of the rest being made up of heavier nuclei. Electrons, gamma rays, and very high energy neutrinos also make up a much smaller fraction of the cosmic radiation. The kinetic energies of cosmic ray particles span over fourteen orders of magnitude, with the flux of cosmic rays on the Earth’s surface falling approximately as the inverse cube of the energy. The wide variety of particle energies is reflected in the wide variety of sources. Cosmic rays originate from energetic processes on the Sun all the way to the farthest reaches of the visible universe. Cosmic rays can have energies up to 1020 eV. There has been interest in investigating cosmic rays of even greater energies. 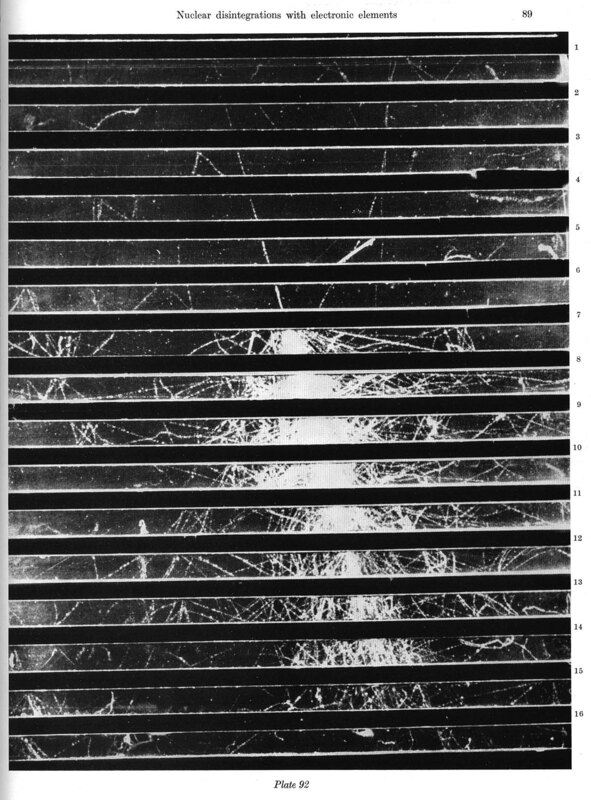 The shower initiated by proton in lead plates of cloud chamber. More recent investigations have verified that the frequency as a function of shower size is sufficient to permit practical measurements on events with primary energy up to at least 1017 eV. This fact accounts for the two principal motives for continued study of the EAS: to gather information related to the origin of the primary cosmic rays, and to investigate the nature of the interactions of extremely energetic particles. The origin of the primary particles, the nature of any subsequent acceleration that they may experience, and the properties of the space in which they travel before reaching the earth determine several features of the local intensity that may be observable: the charge spectrum of the primaries; the shape of the energy spectrum; fluctuations of the intensity that may be correlated with disturbances on the sun or elsewhere outside the earth; and a possible asymmetry of the directional distribution in space, appearing as a periodic variation of the local intensity with solar or sidereal time owing to the rotation of the earth. In all of these respects, the primary rays that have extremely high energy, exceeding 1015 eV, may be expected to differ from much more abundant particles of comparatively low energy; and observation of the differences may shed light not only on the problem of the origin of cosmic rays but on various related astrophysical matters. Publishing Co. Amsterdam, 3, 3.